Polli Talu Arts Center, Estonia, information and registration : C.F. 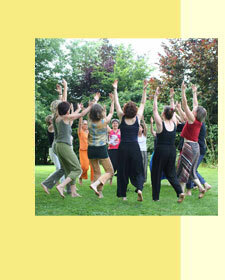 In Bremen there is dance therapy in personal sessions available. The seminar descriptions can be ordered. If you withdraw the registration up to 21 days before the seminar half of the costs plus the costs for the accommodation are due; later the full costs have to be paid. Only if there is someone else taking the place the money will be given back after subtracting a charge of € 30. Please send in a written registration.